As we grow older and face new demands on our bodies—illnesses, limited mobility, loss of vision or hearing—it is easy to focus on only the changes to our physical bodies and forget about the transformations our spiritual selves are going through. Keeping Spiritual Balance As We Grow Older will guide you through readings and practical exercises to reintroduce you to your spiritual side. 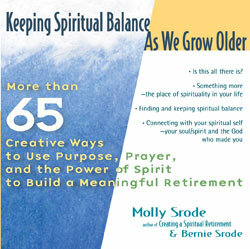 Molly and Bernie Srode discuss how the power of spirit can help you overcome the obstacles of aging, add meaning to your everyday life, and attain both your material and spiritual goals regardless of your religious orientation. With creative, practical advice, this book is brimming with ideas to add purpose and spirit in the building of your meaningful retirement.